I recently attended a black tie party for a family friends birthday and engagement party. I knew it would be a good night, but I was dreading the dress code. I’m not a dressy up person to be honest, and finding a passable dress that would look OK was causing me to stress out. I’m not even kidding. My whole family are very good a dressing up and assuming a new type of elegance at these sorts of occasions. I however missed out on this ability. While I am getting better at things like walking in heels, I usually just feel really out of my comfort zone and extra self conscious, because I know that a lot of the people at these things really do judge you by your looks. I’m always the fat one. I’d traipsed all around town and tried on dress after dress, with no luck, so I headed on line to Simply Be. Simply Be caters for larger women with sizes starting at a 12 and going all the way up to a 32, selling everything from underwear to shoes. They have a great range of designers and various celebrity ranges, like Gemma Collins from TOWIE. I finally ordered this lovely Pink Anna Scholz dress, deciding to stay away from my usual black as I have been feeling more body confident recently. I like the way the detail down the middle gives me a really voluptuous silhouette. 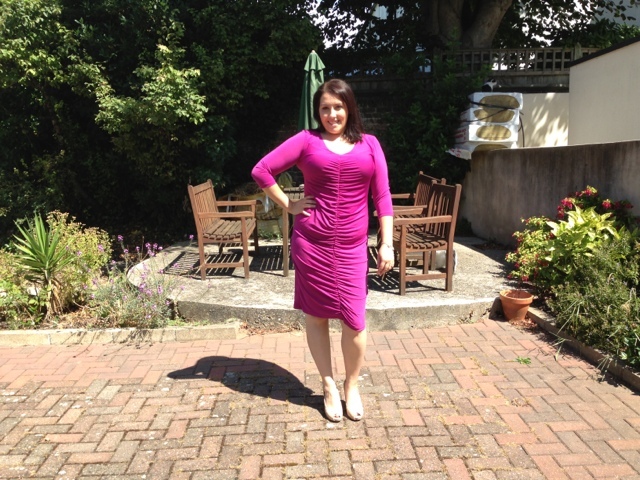 I got the dress in a size 16, but I think the 14 might have been slightly better, you can see that the extra fabric hangs off my stomach which highlights it slightly, although to be honest when you have a belly your never going to look like a slim trim 12! Despite my tummy concerns, I got so many compliments on the night and although initially I felt a bit self-conscious, I quite quickly felt like myself again. Overall the design was lovely – I adore the colour – and made with good quality materials, not to mention it was so comfy which really put me at ease.